Balance is for losers. Any bike that’s “well-rounded” or has “broad appeal” is purpose-built to be bad at everything. That’s been the sad truth about dual-sport bikes since the invention of the license plate. Thankfully, there are people in key places at major motorcycle factories who have come to understand that. The new crop of dual-sport bikes has been designed with dirt as the number-one priority. That was never the case in the old days when the best we could hope for was a 320-pounder with high fenders. Now, the goal is to make a dirt bike that’s legal on the road. Unfortunately, the Feds haven’t made that easy. The regs for DOT and EPA approval are vague and subject to different interpretations. As a result, each of the companies plays by a different set of rules—some very conservative, others right on the edge. 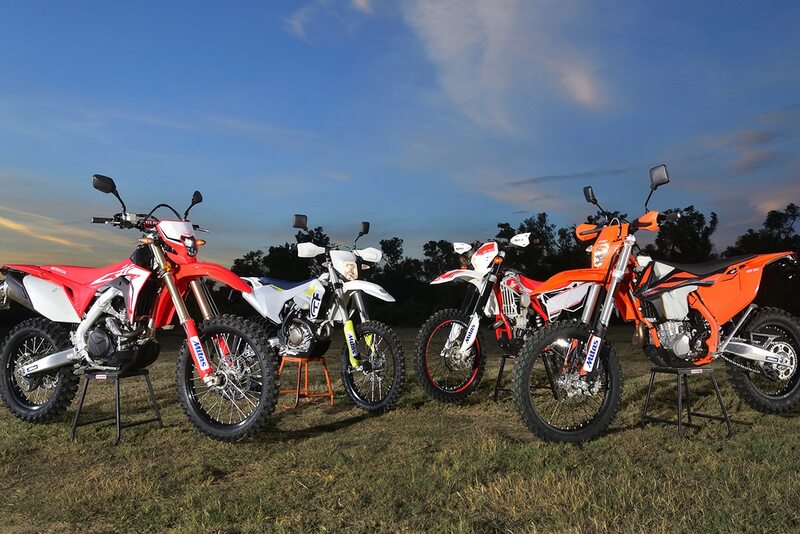 We gathered the Honda CRF450L, the Husqvarna FE450, the Beta 430RR-S and the KTM 500EXC for a battle in the dirt. They don’t exactly match in displacement, but this isn’t about a racing class. These are what we consider the four best dual-sport bikes in the world from an off-road rider’s point of view. We will let other publications talk about how well-rounded they are for commuters and road riders. For us, the street portion of the test has only two questions: 1. Is it legal on the road? 2. Is it practical on the road? For all four of these bikes, the answers are yes and yes. With our emphasis on dirt worthiness, we stripped the bikes of their original tires. The Honda’s IRCs are mostly aimed at street, and the Continentals on the KTM and Husky were selected to help pass sound tests. Only the Michelin Enduros on the Beta are dirt-oriented, but even they have reduced knob height as required in Europe. We put all the bikes on Mitas tires, which are the most aggressive DOT knobbies we could find. If you don’t know Mitas, you might remember the firm’s parent company: Trelleborg. Then we evaluated the bikes mostly in the dirt. For us, pavement is simply a means to connect trails. The Beta 430RR-S is one of four different displacements that share the same platform. Beta is a small company that builds its products in Florence, Italy—motors, frames and all. In this case, being small is a big advantage. Beta isn’t scrutinized as closely as Honda, KTM or Husqvarna when it comes to emissions and noise testing. The bike is clean and quiet enough to pass the standards set forth for a small importer. The testing and certification process is still lengthy, bureaucratic and expensive. That’s why Beta doesn’t have a dedicated off-road four-stroke in the standard lineup anymore. These days, a true off-road bike is required to go through a similar gauntlet of regulations. Beta does offer a closed-course competition four-stroke as a limited-edition model. Beta has four dual-sport bikes that share most of the same parts and look nearly identical. There’s a 350, a 490, a 430 and a 500. All use the same electric-start motor with the only difference being bore and stroke. It’s a double-overhead-cam four-valver with a six-speed gearbox and Synerject fuel injection. The chassis has a steel backbone frame with Sachs suspension. The rear shock uses linkage. The wheels have Nissin brakes, and a Trail Tech GPS is standard equipment. For a Dirt Bike Magazine video featuring the 2019 Beta 430RR-S, click here. 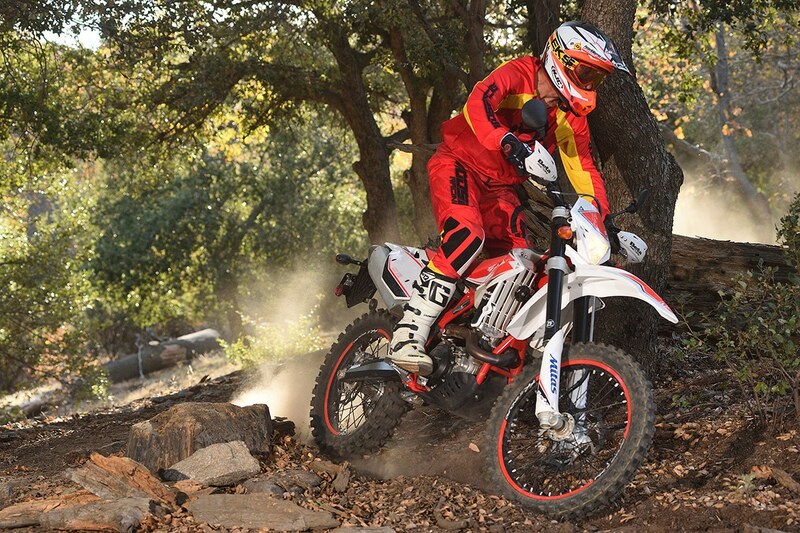 Honda reignited the dual-sport world when the CRF450L was introduced. This bike lit up social media when it was announced. People were equally divided between those who thought the bike was the answer to all the world’s woes and those who thought it was trash on wheels. None of this was grounded in fact; it was just the internet doing what it does. 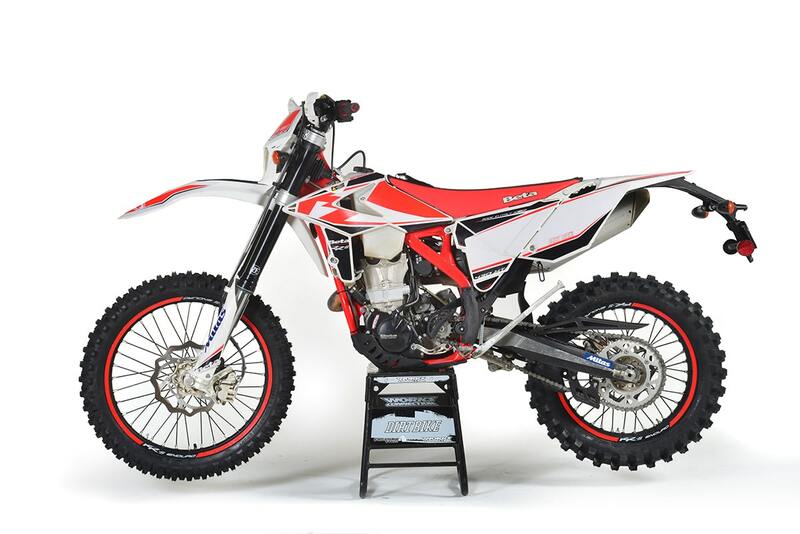 The bike is loosely based on the latest version of the CRF450R motocross bike. The SOHC motor is in a very different state of tune, though, and has a six-speed gearbox. That causes the engine cases to be wider, which means the frame has to be different. It also has a number of brackets that the motocrosser doesn’t need. The suspension components, on the other hand, are identical to those of the MX bike aside from spring rates and valving. It has a fan and a rather obtrusive thermostat on the right side of the motor. The muffler has a catalyst inside, and the engine is encased in plastic covers that offer protection and dampen sound. The fuel tank itself is made of titanium and holds just over 2 gallons. Honda splurged on some aspects of the bike and economized on others. On one hand, it has the best headlight of the bunch—a multi-element LED setup that’s far brighter than the others. On the other hand, it has a 7/8-inch handlebar and no handguards. Also, it’s the only one without a hydraulic clutch. 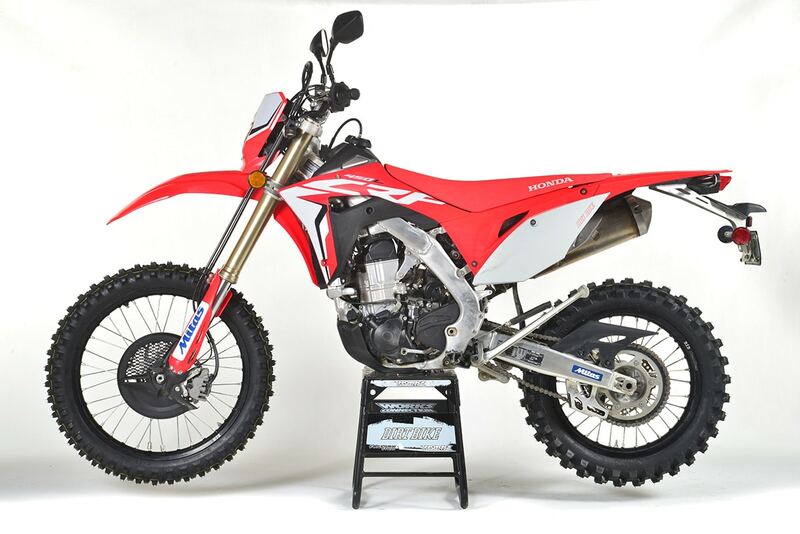 For a Dirt Bike Magazine video featuring the 2019 Honda CRF450L, click here. 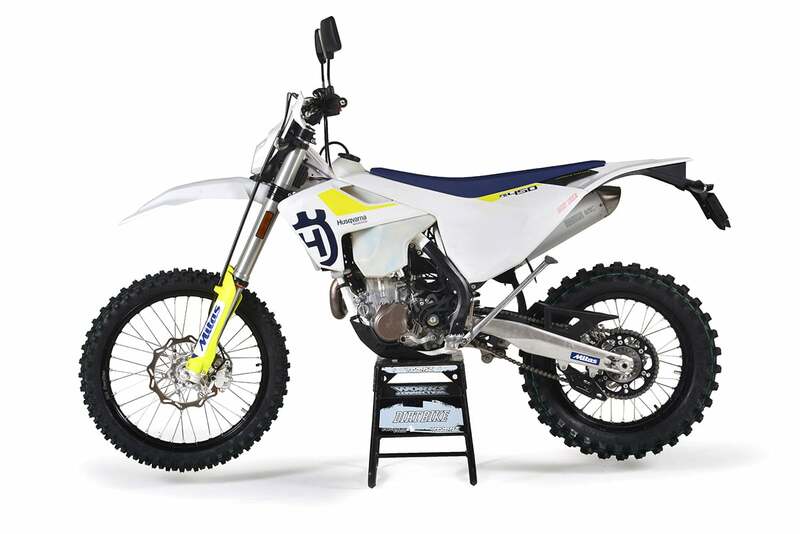 The Husqvarna FE450 might come out of the KTM factory, but it’s very different from anything in orange. For those who say that Husqvarnas are just white KTMs, the FE450 is stark evidence to the contrary. There’s no 450 counterpart in the regular KTM line. Beyond that, the frame is different from that of the KTM EXCs, because it has linkage suspension. The subframe is a polyamide unit that incorporates the airbox. 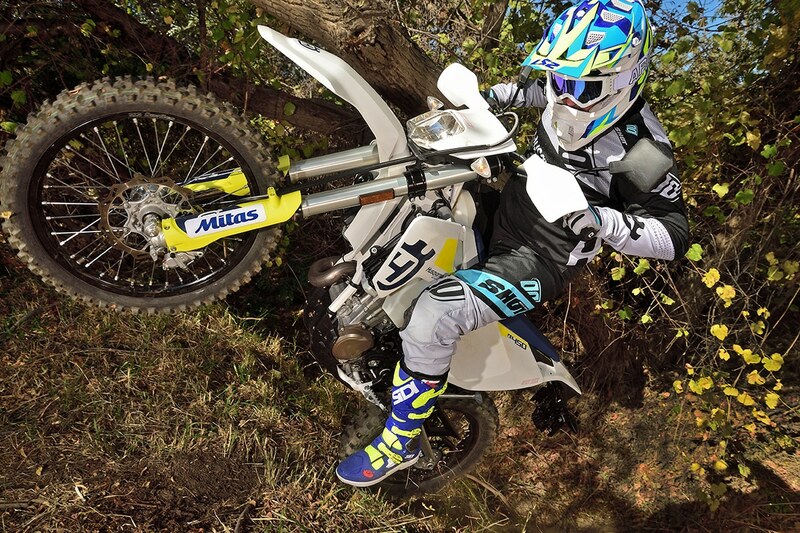 The hydraulics for the clutch and the brake systems are made by Magura—all these are found only on Husqvarnas. Only the fork is identical to the unit found on the KTM dual-sport. It’s a WP Xplor coil-spring fork. As for the motor, it’s the single-overhead-cam, electric-start design that’s based on the bike that Jason Anderson used to win the Monster Energy Supercross title. Like the Honda, it’s detuned and houses a six-speed gearbox. Husky is considered a big manufacturer, so the bike must be very quiet and clean. Apparently, the noise standard is the toughest to meet. In order to pass, the engineers in Austria and the testing department here in America came up with some pretty interesting technology. For example, there’s a reed valve between the airbox and the throttle body to dampen noise intake. 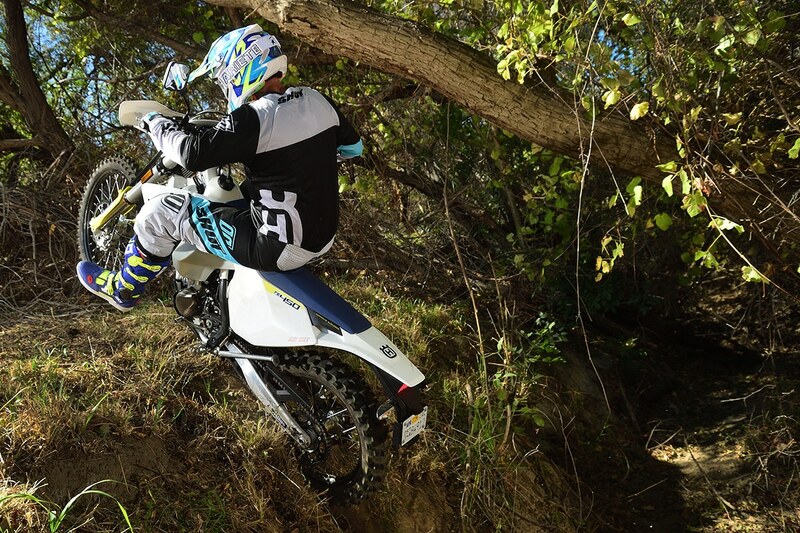 For a Dirt Bike Magazine video featuring the 2019 Husqvarna FE501, click here. KTM only offers a 500 in its regular dual-sport line, so it comes in with a displacement advantage. 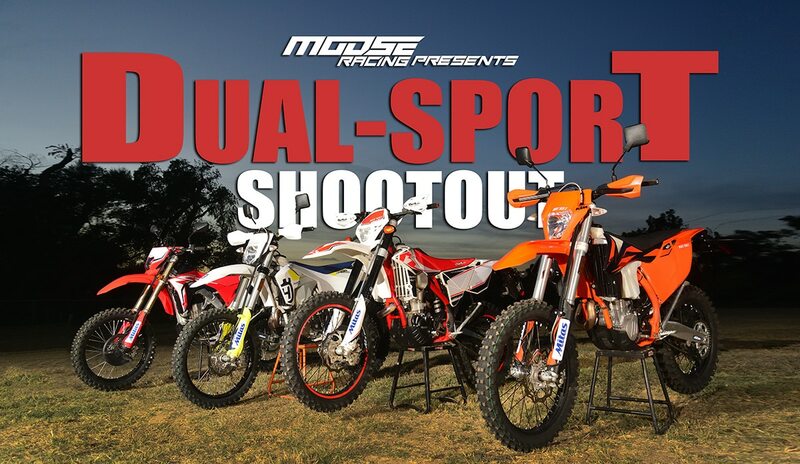 The KTM 500 is the closest thing to a 450 dual-sport that KTM offers in its regular lineup. There is a limited-edition Six Days 450EXC that comes out each fall, but it’s hard to find and generally expensive. It essentially has the chassis of the 500EXC with the motor of the Husky FE450. The motor in the 500 is similar to the 450’s in the combined KTM/Husqvarna line but gets its additional displacement thanks to a 72mm stroke, 8.6mm longer than the 450’s. The one design element that’s most significant on the KTM is the use of PDS rear suspension. That eliminates the shock linkage and increases ground clearance. The KTM also has completely different bodywork from the Husqvarna. Many of its components are different too. It has a Neken handlebar, Brembo brakes, Brembo clutch hydraulics and Excel rims. The aluminum subframe and the airbox are separated, but the bike uses the reed valve in the airboot, just like the Husky. 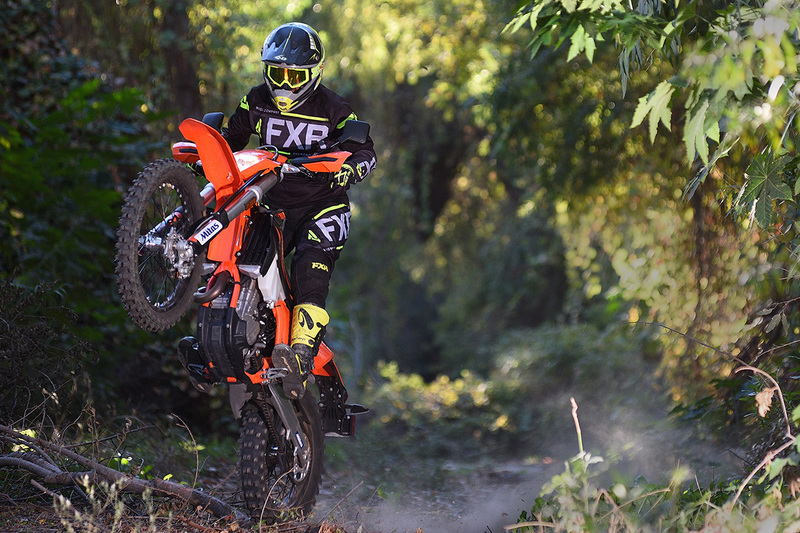 For a Dirt Bike Magazine video featuring the 2019 KTM 500EXC, click here. The lightest: Despite having the most displacement, the KTM 500EXC is the lightest at 244 pounds without fuel. In weight, the four bikes span a wide range. All four bikes have done away with the kickstarter to save weight, relying only on the electric starter. All four use lithium batteries that are almost identical in weight and size. 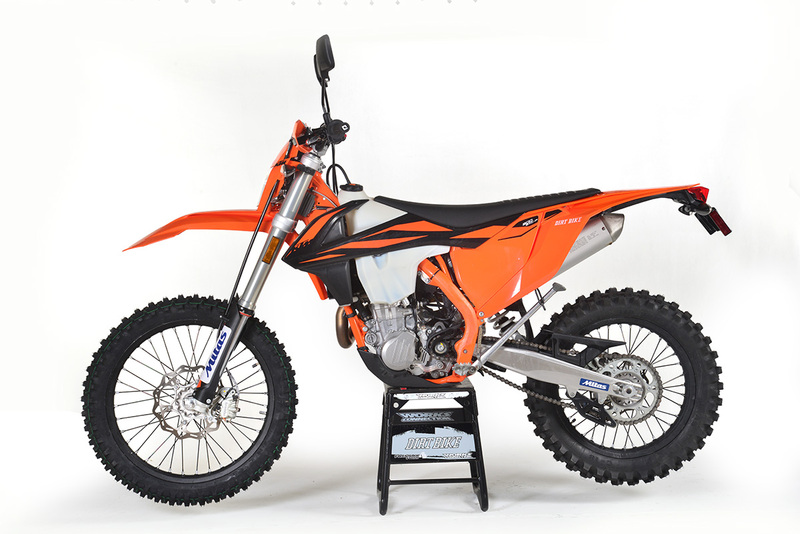 On our scale, the KTM 500EXC is 244 pounds without fuel. It’s the lightest thanks to the PDS rear suspension without linkage. The Husqvarna’s chassis, rear suspension (with linkage) and bodywork are all different, which adds up. It weighs 248 pounds. The Beta has linkage, too, and comes with a Trail Tech GPS as standard equipment. It is 252 pounds. The Honda is the heaviest by a large margin. It’s 277 pounds without fuel. Interestingly, most makers are fairly honest about weight. They all list weight fully fueled, and once you allow 6 pounds per gallon, they are fairly close. We drained the tanks and measured fuel capacity as well. The KTM and Husky hold 2.2 gallons. The Honda holds 2 gallons. The Beta holds a touch under 1.9. Finally, there’s price. The gap is smaller than ever. The KTM is the most expensive at $11,199. The Husqvarna comes in next at $11,099. The Beta sells for $10,499, and the Honda is $10,399. All these prices are subject to add-ons, like destination, setup, tax, license and even dealer markup. In peak power, the Beta is tops despite its smaller engine size. The people at Honda, KTM and Husqvarna are quick to point out that Beta is playing by a different set of rules. The 430RR-S is louder (but still quiet) and presumably has more tailpipe emissions. Fine with us; it’s still legal in all 50 states. In low-end power, the KTM’s extra displacement gives it an advantage. The Honda is still very close to the KTM in power, and the Husqvarna isn’t that far behind. In terms of manners, the Beta is again the most pleasant of the four. It has somewhat soft low-end power and the tallest first gear, but both of those factors are to its benefit because the power delivery is so smooth. The Honda has the most aggressive power delivery with instant throttle response and a fairly low first gear. It’s snappy and has unusually drastic engine braking. Some riders like this; others don’t. The one aspect of the Honda that everyone complains about is its tendency to stall. This isn’t the usual cough-and-die syndrome that comes with lean, EPA-approved fuel mapping. The Honda can simply stop when you’re maneuvering at low speed. It has strong brakes and a grabby clutch, which contribute to the problem. Both the KTM and the Husky run clean 90 percent of the time. They can both stall, too, but it doesn’t happen as frequently as it does with the Honda. In this case, it usually comes with a cough or a backfire. First gear on the two bikes is identical and is somewhere between the Honda and the Beta in terms of gear ratio. The most comfortable: The Honda is the best bike for spending days in the saddle. Suspension is another matter. The Honda clearly comes out on top here. We have often found that heavy bikes have better suspension, and that might be a contributor. It has the best overall ride and covers the broadest range of conditions. The KTM is much improved over last year’s version. The fork is less divey, and everyone likes the PDS rear end. It’s still very soft overall. Riding the Husky and KTM back to back allows you to explore the differences between PDS rear suspension and linkage. For slow-speed trials, most riders say they like the PDS better. 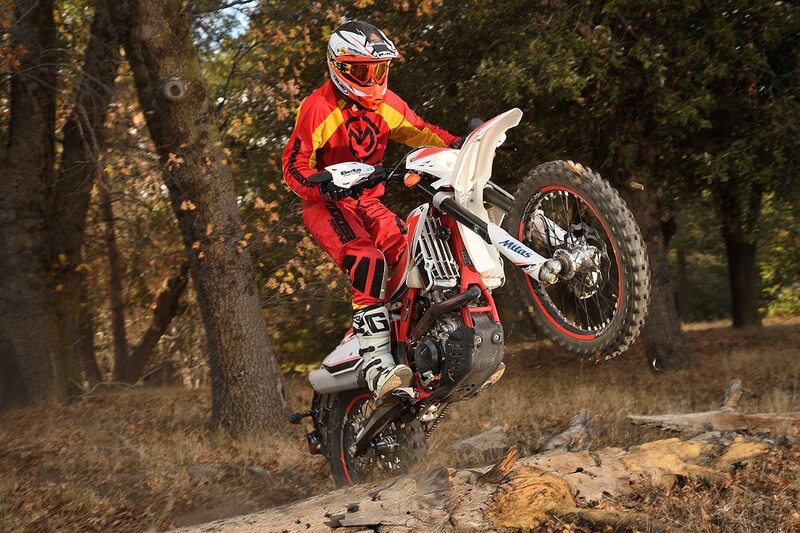 In fact, riders like Cody Webb and Jonny Walker prefer PDS suspension for their extreme enduro mischief. It goes beyond the advantage in ground clearance; they just like the action. Most riders agree that as speeds increase, the linkage design on the Husky feels more stable. If you were to modify these bikes for closed-course racing, it would be more practical to start with the Husky’s design. For Beta, the Sachs ZF fork is new this year. It’s firmer than the suspension on the other bikes. That makes it more stable, but it can feel harsh in choppy terrain. The most potential: Few dual-sport riders leave their bikes alone. The Husky can be made into a racer with little effort. There’s no denying that the Honda’s weight is a big handicap. It’s such a big, heavy bike, it truly feels like it belongs in a different category. It’s interesting to note that the weight issue is inversely related to speed. When you’re in first and second gear, the Honda feels like an Africa Twin. At higher speeds, the handicap disappears. In fact, the Honda is the king of the fire-roaders. It feels perfectly stable at speed, and with all that engine braking, you can drop a gear and drift the rear end, Jared Mees-style. The snappy throttle response and the engine braking also make it a natural wheelie king. The front end comes up easily and comes down as soon as you chop the throttle. In terms of pure handling, there’s absolutely nothing wrong with the KTM, especially at low speed. It’s the lightest, and you know it. The bike is super easy to manhandle, and it seems to hop over holes and soft spots where the Honda gets stuck. The suspension is ideal when it comes to rocks, roots and trail trash. The Husky feels similar, but not identical, to the KTM. The differences in the motor, rear suspension, and seat and handlebar make it feel very different, although riders were hard-pressed to say one was better than the other. 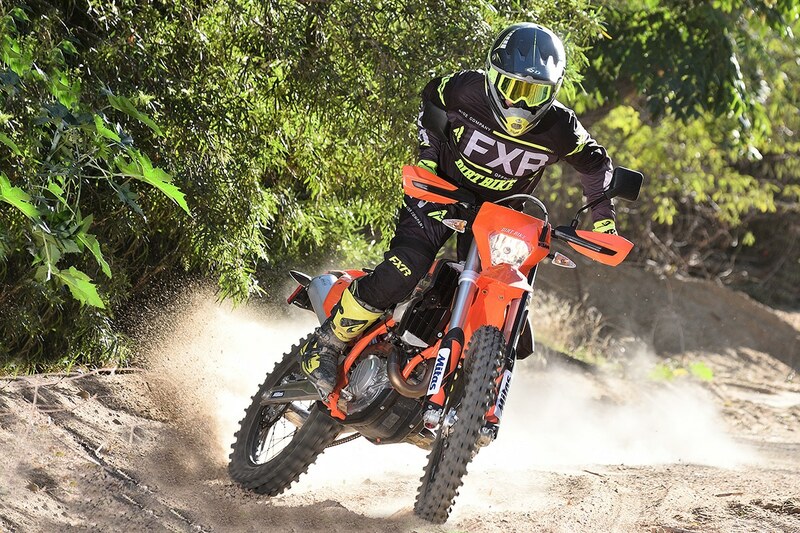 The fact that the KTM 500 has a more aggressive power delivery and a slightly more pronounced tendency to stall made the Husky a little easier to ride in more extreme off-road conditions. If you didn’t know the Beta was a dual-sport bike from the presence of blinkers and mirrors, you would think you were on a dedicated off-road bike. It feels fairly light and handles like a two-stroke. Everything about the Beta screams dirt bike. To be fair, this is more of an overall perception than a product of geometry or engineering. Much of it comes from a combination of firm suspension, glitch-free power delivery and even a barky exhaust note. The layout of the bike is a little offbeat. It feels long and low, with footpegs that are closer to the ground and more rearward than the other bikes’. We wouldn’t hesitate to take the Beta straight to a national enduro without modification. If you had to spend a day covering ground on one of these bikes, you would choose the Honda. It has the best seat, the least vibration and the quietest exhaust note. It’s also put together well. The blinkers won’t break off. The rear fender is so well supported you could stand on it, and it gets excellent fuel mileage. The fan runs almost every time you stop, but that’s all the more reason not to stop. The headlight is so bright you can actually ride well into the night. On the other end of the spectrum is the Beta. It has a harder seat, a little more vibration and runs out of gearing on top. It’s not for crossing vast stretches. It also has the least durable DOT components. The blinkers and rear fender extension will, eventually, break. At some time or another, you will also leave the key on and drain the battery. The other three bikes have built-in safeguards to keep this from happening. Husqvarna and KTM show their common bloodline by landing between the two extremes on the comfort scale. They both have firm, thin seats, but they are not as hard as the Beta’s. Their blinkers and taillights are durable but not as solid as the Honda’s. They are almost as quiet as the Honda but have a soft hum generated by their reed-valve intakes. The most dirty: Beta’s dual-sport bike is a pure dirt bike with only the barest of street accoutrements. So, choosing the right bike for you requires a bit of honesty. We have no way of knowing how much dirt you ride or if you plan on using one of these bikes to ride back and forth to college. All we know is what we like and where we ride. To a man, every rider on the Dirt Bike staff prefers riding the Beta over the other three. It’s the one bike that’s a worthy replacement for an off-road four-stroke. We don’t miss the fact that Beta makes no dedicated four-stroke dirt bike because the 430RR-S isn’t lacking anywhere. Next, we would choose the KTM 500EXC. It can be used as a legitimate off-road four-stroke, too, but unlike the Beta, it feels and runs a little choked up. Still, it has decent power and is unnaturally light. The Husky in this comparison has an admittedly unfair disadvantage in displacement compared to the KTM. It feels even more choked up. 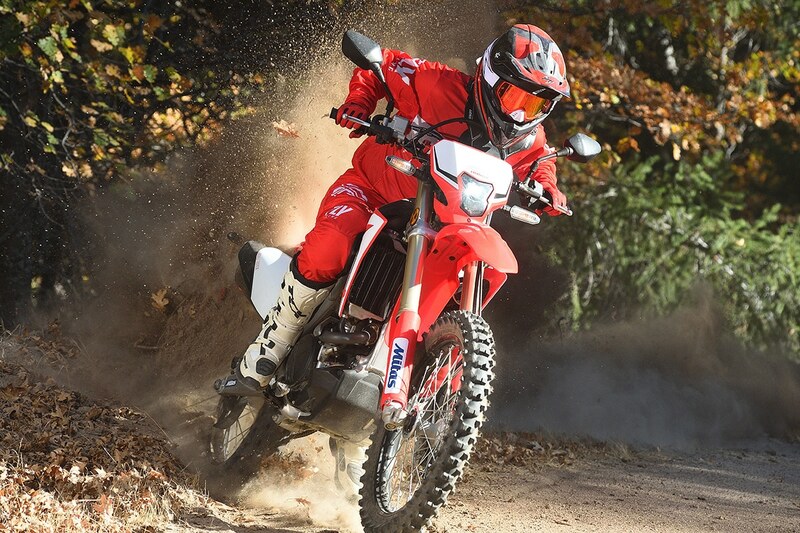 Most dual-sport purists point out that the Husky is more easily modified into a pure off-road bike. Some of the parts, specifically the air intake, from the competition-only FX450 will fit on the FE easily, whereas the KTM’s PDS design prohibits this. The Honda is the least dirt-oriented, which isn’t surprising. Honda made the bike with street use as a high priority, and it would certainly be the best choice if that’s a priority for you as well. For us, though, it’s all about dirt bikes. It’s in the name on the cover.